Marella XL Water Filter Jug with a volume of 2 Litres of purified water (total volume 3.5 Litres). It has convenient flip-top lid which allows Single-handed filling without removing the lid. The jug is provided with an electronic battery operated Cartridge Change Indicator to remind you to change the cartridge after 4 weeks.Maximum Retail Price or MRP Rs. 1295-. More from the Usha Brita site. 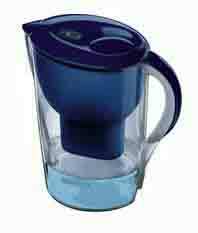 Usha Brita WATERGUARD Max is an offline (Storage type), table-top water purifier. Unique 4-Stage water Purification- based on Demand Release Iodinated Resin. The unique cartridge system imparts Bacteriostatic properties to the purified water (it can be stored for 48 hrs without any regrowth of bacteria). It is a two-container system which has a total storage capacity of 23 liters with a self-regulatory flow control to avoid spillage. The complete system is made of food grade material with a transparent top container to monitor the Water Level. A water level indicator is provided on the bottom tank to see the level of purified water available in it. It employs a special World Wide Patented Technology to eliminate germs, suspended impurities &chemicals to purify water while improving its taste. The unit has been tested & certified by leading German & Indian Institutes & Laboratories. Long life Cartridges- capable of purifying up to 1500 liters of water per set of cartridges. No Plumbing (running water) or Electricity is required. Maximum Retail Price or MRP Rs. 2999-.